Rain's Garden: Christmas - More Memories Made! These are the last of the Christmas cookies! The day before Christmas Eve, I made Hungarian Walnut Cookies, Hot Cocoa Cookie Cups and Alex's favourite Cherry Ice Box Cookies. The walnut cookies were okay, but the dough was too overwhelming. The cocoa cups were yummy and we always love those ice box cookies! We had our traditional pizza night on Christmas Eve while we watched Home Alone. I wrote a page in my recipe index called Pizza Ideas, and I'll keep adding to it as we try new ones. 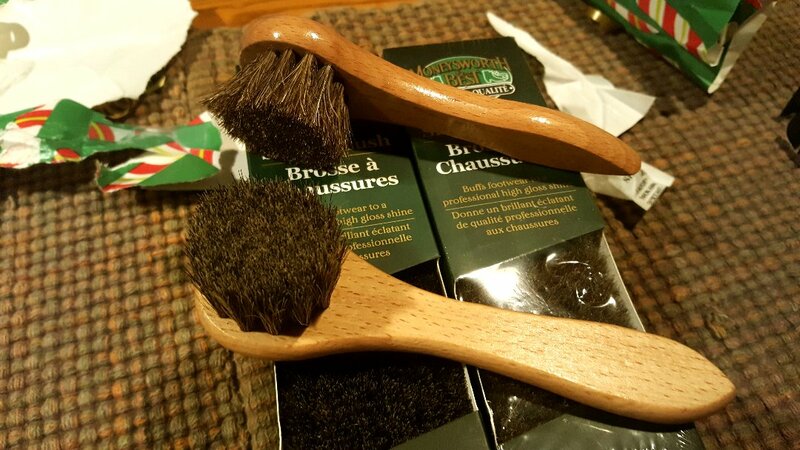 We opened up our stocking stuffers and now have some good hat brushes for all of our hats! We had a perfect Christmas morning! There was a blizzard and it snowed all day long, good thing we didn't have to shovel out. He also got me cookbooks...the Booze Cakes book is full of delicious cakes! I can't wait to make them. 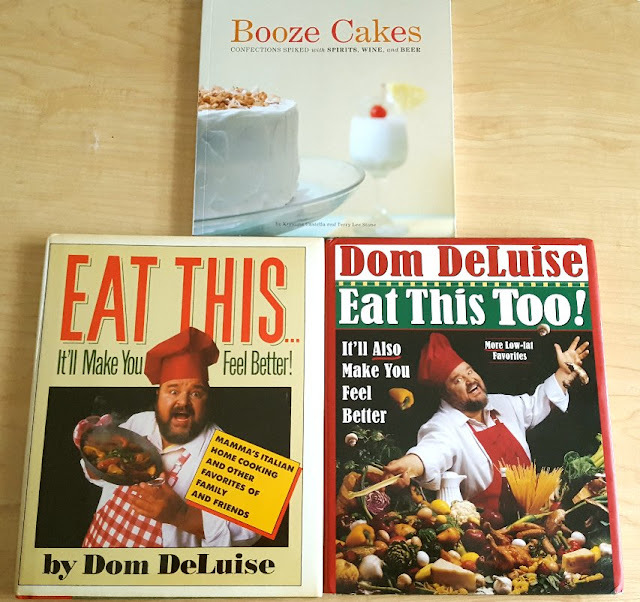 The Dom DeLuise books are so darn funny...I love that man and he has so many delicious recipes, I can't wait to try them out too! ..I also got him a bottle of extra old brandy and a nice pipe. The theme was comfy and cozy so I figured he could wear the pj's, read a book, smoke his pipe and have a snifter of brandy. :) He loved it! Then the cooking began! Alex and I made dinner together. 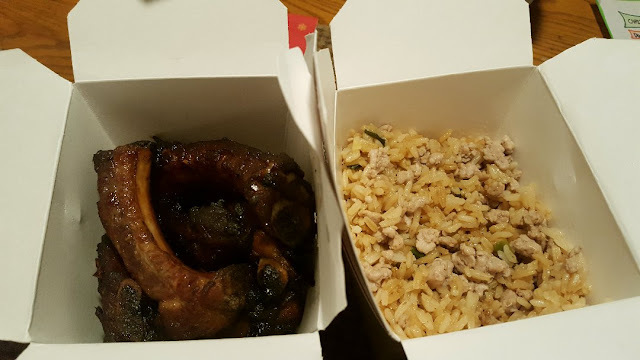 We made a Chinese food dinner. It really turned out well! This part was a surprise though. I shoo'd Alex upstairs while I brought out my take out containers. 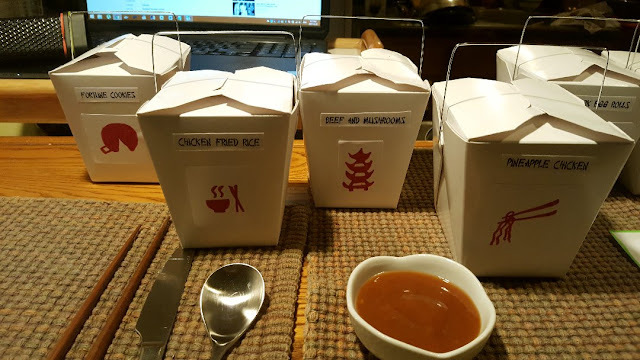 I found a "Chinese Take Out" font and printed the names of the dishes and drew the little symbols on each one. It made the dinner so much fun, we ate right out of the containers and into the fridge they went for leftovers after. I forgot to take pictures of the Fried Liver with Tomatoes and the Fortune Cookies. The cookies, frankly, sucked...but I found some fun Charlie Chan proverbs to put in them so we had fun reading them, but they were inedible!! 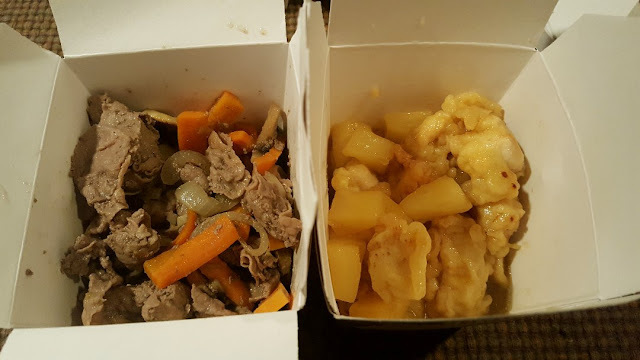 We don't have anywhere in this area for good take out, more less Chinese take out, so I wanted to make it special. 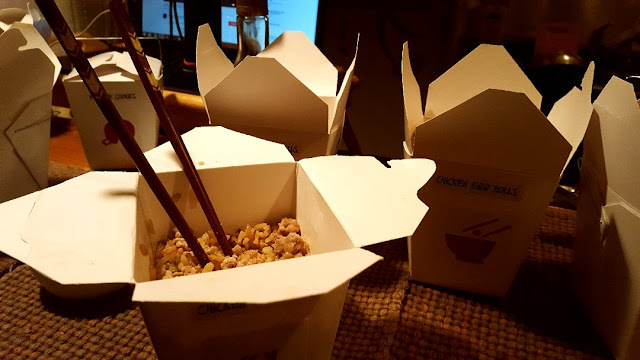 I wrote my recipes here: Chinese Food Dinner. But...this took just over 8 hours to prepare and cook...eegad and there were two of us, really, that was far too long on Christmas day. Next year there will be a much easier meal I think! 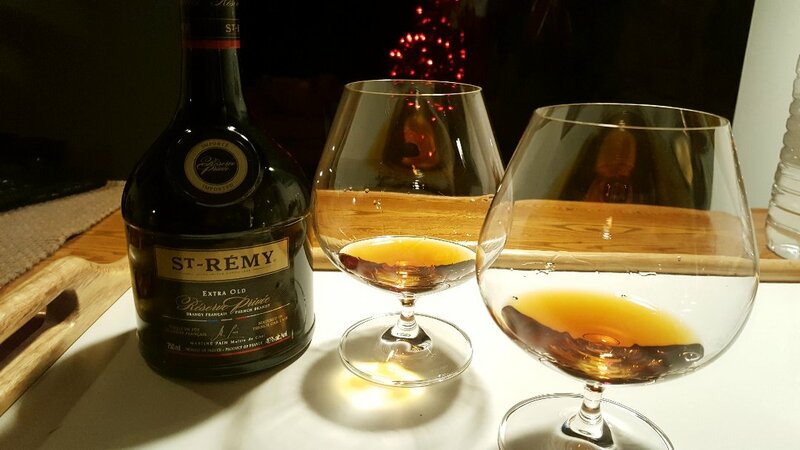 We finished off the night with some of the brandy and fell asleep to a movie. Today is all about resting and playing with our gifts! I hope everyone had a nice day and made lots of wonderful memories! That is some Christmas, Rain. Your cookies I would love to try. I love your gifts to one another. That pipe is awesome. I like the looks of that brandy even though I know nothing about brandy. Glad you had a wonderful holiday. 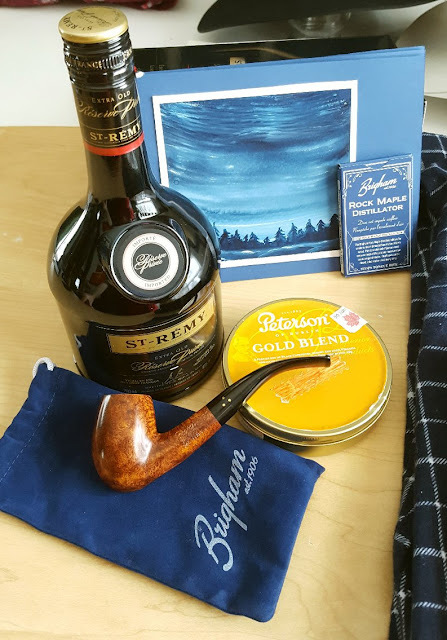 It looks like a perfect Christmas! You are obviously a fantastic cook. What a wonderful Christmas you guys had! 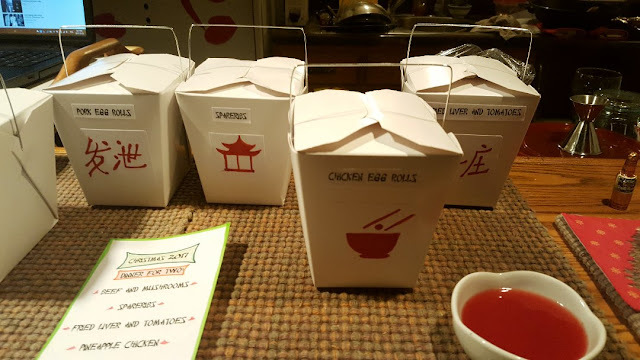 I'm so impressed with your Chinese food takeout containers! A truly "finishing" touch! What a great Christmas and all the awesome gifts and food! You guys really know how to celebrate! I love your hats...they're beautiful! 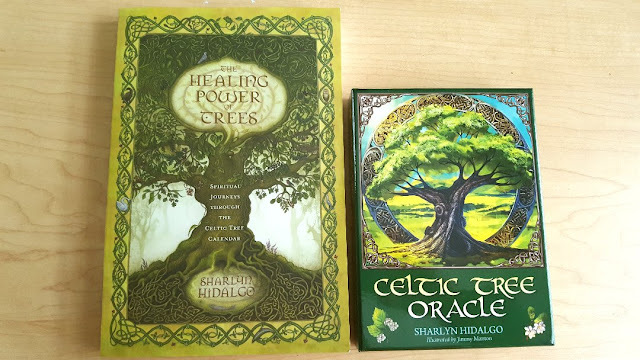 Are Oracle cards similar to Tarot cards? Your painting is gorgeous for sure and the gifts you gave Alex were awesome! Love those pj's...I need to make some for myself! The books all look interesting and the cookbooks are so cool! You guys ROCK and you were so lucky to have a blizzard and the fireplace and the great food and brandy! 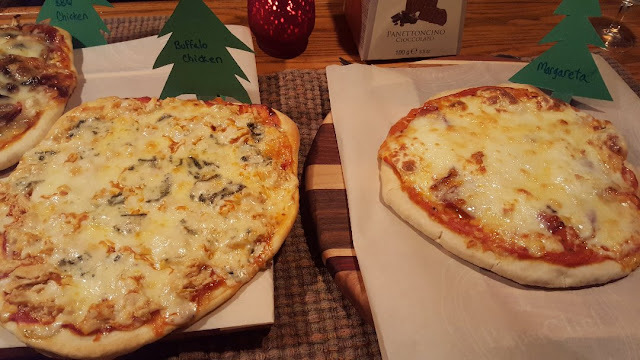 Also, I loved every one of those pizzas you made for Christmas Eve. I am seriously going to be cooking a lot....soon! Your recipes too! That Chinese dinner looked fabulous especially with your take out boxes. You ARE amazing! I'm so glad you had such a wonderful Christmas....I knew you would...you guys could teach classes on how to live in the moment and make every moment count! Love you guys! I like those hats, they are useful when the weather is bad. Lots of cookies for Christmas, my wife makes some kind of chocolate cube shaped cookies that she rolls in powdered sugar. She uses me to test things on and put one in my mouth and it was nasty as she had used a box of corn starch instead of powdered sugar, luckily she had only done a couple before the test. I want Chinese food now! Rain your enthusiasm for life is contagious,, you truly live life to the max,, making everyday special. You are a refreshing inspiration! 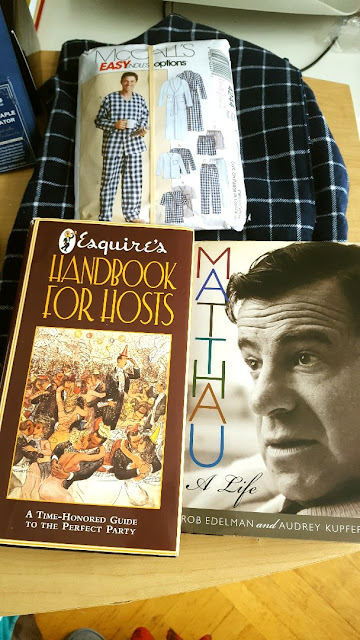 The gift are lovely, the hats are beautiful, you making pj's, what a beautiful gift! The special meal,, amazing,, happy holidays Rain, I am so glad I have found your blog, its always a joy to visit! Everything looks wonderful Rain. Merry Christmas! Oh my gosh, Rain, what an amazing Christmas you had! From the ambience to the gifts to all the amazing food...everything is so...right. Cookbooks are always fun, aren't they? 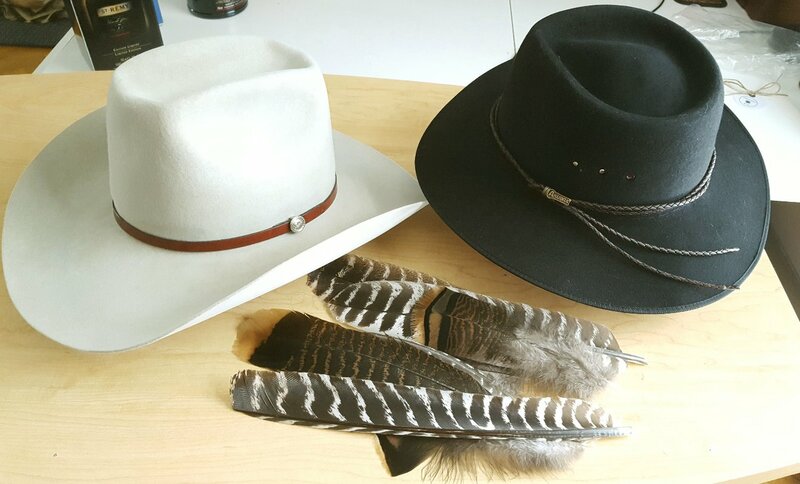 And I just love those new hats! How adorable. I'm so happy for you. These are wonderful memories of a very special time of year. I'm a little sad that Christmas has WHOOSH come and gone. I can't believe how fast times goes. But I am looking forward to the next few months passing so we can get outside and start working on our garden! There is always something to look forward to. The weather had me a little worried on Christmas day but it didn't get too nasty and my family was able to drive in from Montreal. We had a lovely time. I can't tell you how happy I was that day being able to finally host a holiday gathering with these amazing people. Anyhow, I'm off to sort the leftovers and see what I can freeze for future meals. I wish you a beautiful day! what a great xmas! the chinese food containers are so cute! i'm glad you had such a good one. we even got some snow here! Happy week between Holidays! "Time, out of time." Cozy time. Read books time. Sit by the fire time. Hunker down and take it easy time. I too think you had more fun than the rest of us put together, haha!!!!! The food looks awesome, and all the extras certainly made staying home in the warmth and comfort - that only 'home' can bring -so lovely. Must have been the best Christmas ever Rain. Mmmmm... more delicious food. I'm especially drooling over the mushroom topped pizza. :) My favorite mushroom pizzas are made with mushrooms out of a can, though. It harkens back to my childhood. There was a little pizza parlor across the street from my childhood home and that was my first experience at eating mushroom pizza. The mushrooms were those little squeaky ones that come out of a can. Some would say, "Yuk", but to me it was a little slice of heaven. And the pizza came in a tented paper sleeve. Does anyone use those anymore? Completely impractical (especially if you're ordering more than one pizza), but it's another pleasant memory that I wish I could experience again. 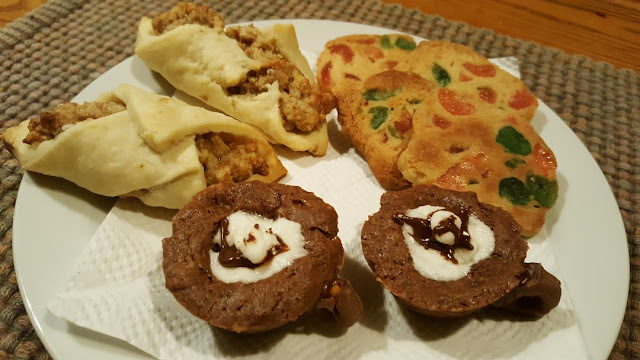 Thanks for sharing your wonderful Christmas, the baking looks fantastic, yum. Sounds like you guys had the most amazing Christmas! Loving your hats! How do you keep from being 400 lbs with all that amazing cooking you do? i LOVED the each bit of this detail dear Rain!!! you planned your christmas day so amazingly and gifts are wonderful from both of you ,either i can't imagine living without trees! your way of food presentation was fantastically mind blowing ,so much fun i can see . thank you for sharing your lovely adventures with us ,enjoyed a LOT!!! have blesses new year and merry christmas my dear Rain! What a lovely day you had. 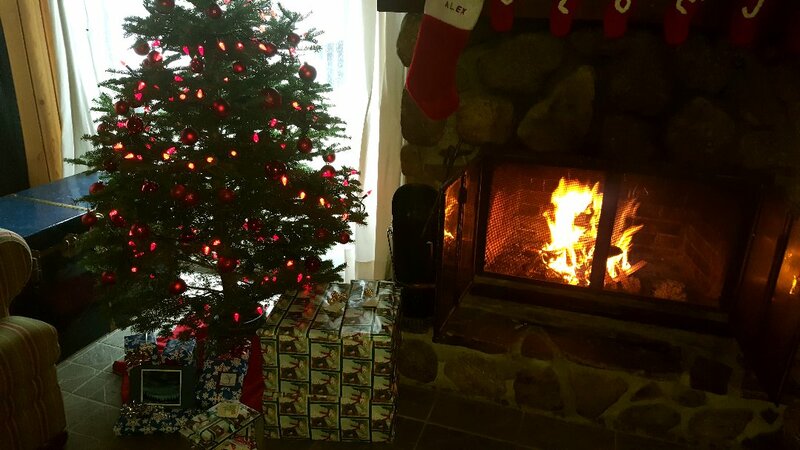 I blizzard and a warm fire sound like the perfect Christmas to me. I love snow as long as I don't have to shovel it or drive in it. But to sit and look at it is so comforting to me. Your food looks so yummy. Too bad it took so long to cook, but then it looks like you will get at least 2 if not 3 meals from it. How clever of you to get the oriental food containers too. Thank you Sam :) Oracle cards and Tarot cards are very similar, and if you ask me, CAN be interchangeable...but not to the die-hard Tarot lovers. They both give advice, suggestions, have meanings and symbols to be interpreted. Tarot is more structured and has a set number of suits and cards; where Oracle decks can have any number of cards. I really don't think there is too much difference in that I interpret them more on my own and how I feel about each card rather than using the "set in stone" meaning. I hope that made sense!! Hi Gill :) Oh gosh...what a surprise when you expected sugar and got cornstarch lol...I did that on Thanksgiving, my first batch of cranberry sauce. I read "Apple Cider Vinegar" instead of "Apple Cider". I cup of vinegar made our mouths dry up lol...I quickly re-read the recipe and made a new batch! Hi Martha :) The whole Christmas weekend was just so much fun! But oh my gosh...8 hours of Chinese food cooking was too much! I thought I had everything all organized...figured it might take about 4 hours or so...but I was wrong lol...I need two ovens lol! At least Alex was there to help out a lot, or we'd have been eating at 2 in the morning. The cookbooks are AWESOME...I'm such a Dom Deluise fan, he was hilarious and his cookbooks are filled with comforting Italian dishes and lots of anecdotes about his life as a celebrity. I know...Christmas is over, it almost feels like a letdown doesn't it??? But our New Year's weekend will be fabulous! What are you guys up to? I'm so happy you had a nice family Christmas!!! Is your house still spotless? Lol...Oh the gardening....I'm so looking forward to that!!! 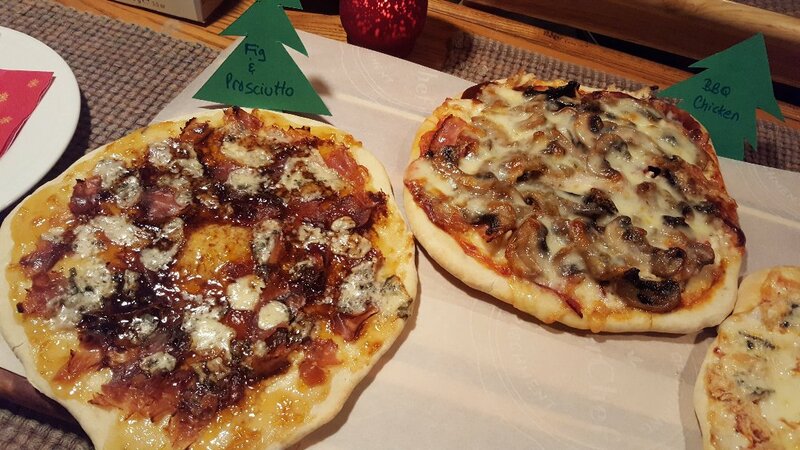 Hi Becki :) That mushroom topped pizza is the BBQ Chicken pizza and I have to say...drool-worthy. Oh you've just given me an idea about the tented paper sleeve! :) I know what you mean about memories coming back like that. I remember cheese pizzas when I was a kid...just some kind of tomato sauce and the Kraft Parmesan cheese all over it. I LOVED that stuff, even though I can't stomach the Kraft stuff now, when I make pizza, there is always a little cheese one for me. I make Margareta, which is basically that with Mozza instead of Parm, but it feeds that memory! Thanks Christine :) We had a wonderful holiday this year! Thanks Leigh :) It was a wonderful Christmas! 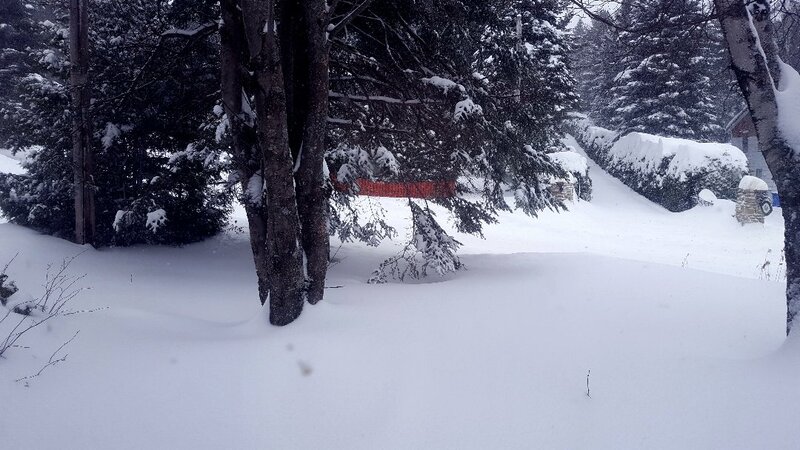 This is the first year in many that we've had such a big amount of snow, which really does make things cozy and magical around Christmas time! Lol Pam...my secret? I eat only one meal a day! It's true. Alex too. We just have a snack in the early afternoon then gorge for dinner. So far we haven't grown too much!! :) And I do 30 minutes of cardio each morning, otherwise I'd gain really fast with my wonky metabolism. What fun!!! Lots and lots of good things right there! Well, you know how my Christmas Eve dinner went so maybe next year I can convince my family to do pizza. We shall see! All your ideas here are fabulous here, esp the chinese take out strikes me as super novel. Love it! 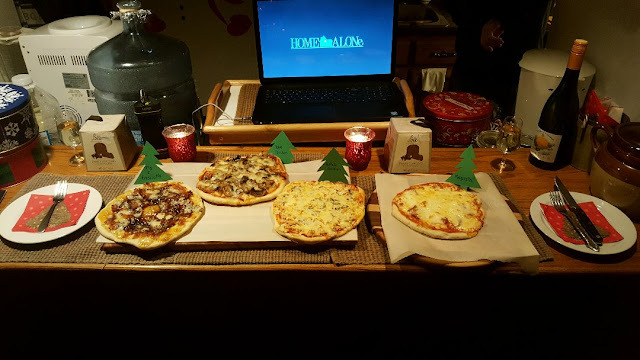 A yearly pizza night on that night of all nights is another wonderful idea. So happy you had such a good xmas. Thanks Michael :) Christmas was a nice time. 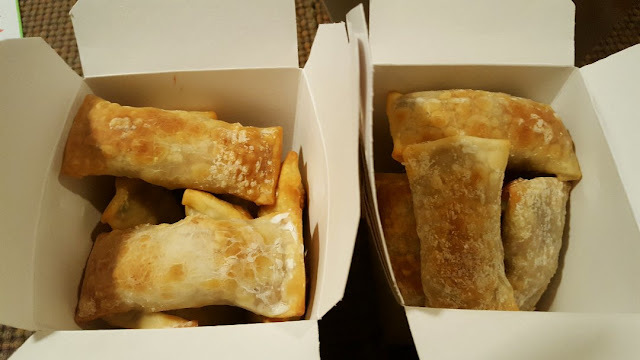 One thing my Alex loves is Chinese take out, so I thought it would be so nice to try to recreate that at home! Lots of work though with one wok lol!